It’s not world’s smallest camera ‘Nikon D70’, it’s Photoshop. 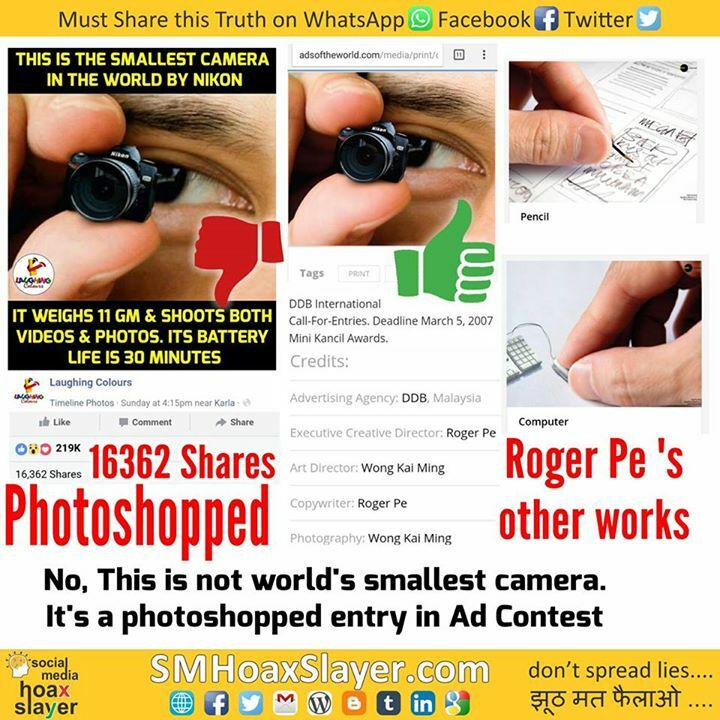 This is merely an entry by “Roger Pe” in an advertising contest. As I said earlier, never take big pages seriously, Laughing Colours use such lies for popularity, likes and ofcourse to sell t-shirts. “With more power comes more responsibilities” but these pages doesn’t know about it. #MumbaiAutoStrike Received this on #WhatsApp just now. I cannot confirm the truth of the narrator’s experience but the logic is true. I’ve faced it and entire mumbai did too. DO READ & SHARE – Yesterday morning, I asked an auto rickshaw driver if he will take me to Seven Bungalows. As usual, he refused, and just stood there. Then I asked another passing auto rickshaw…he too refused and ran off. I asked a third one, he did not even bother to stop. Still, clinging on to dear hope, I requested one more empty auto…he just went off even without bothering to say “No”. Then I turned towards the first auto guy, who was standing there watching my futile efforts nonchalantly. I showed him my Uber app, and booked a cab within 30 secs, though with a nominal surge. Then I told him in Hindi that he should remember the past 10 minutes that he saw, when the auto unions go on strike this Monday. I tried 4 autos and then booked an Uber at surge price. Inferences for the moron(s): 1. The business that the autos lose is not because of Uber/Ola. The fact is that the business that Uber/Ola get is because of the auto rickshaw drivers. 2. A thing the auto guys need to remember – A Mumbaikar has enough money, but no time. So he will take an Uber immediately if you idiots waste his time. 3. Begging every morning for Auto guys to do their duties is not a Mumbaikar’s idea of starting his day. 4. Union’s won’t get you your passengers back. Commitment will. And yes….strikes will just drive the customers further away from you, morons. 5. Auto Strike is awesome. Makes my Mumbai beautiful. And finally….an inference for the Government. Especially IF YOU, MY FRIEND, SHARE THIS POST : If the government bows to the unions pressure for the votebank of autowallahs(half of them are anyway illegal)…you lose my vote for sure…and I am a part of that largely ignored but nevertheless huge votebank called COMMON MAN….whom the Congress just noticed in the last elections. – A Mumbaikar.